Before the Hot Stove heats up, it is important to take a minute and recognize the overachievements of the 2013 Boston Red Sox. Go back to March of 2013. Most writers and fans believed the Red Sox would win maybe 81 games give or take. Fans were happy the “chicken and beer” prima donnas were gone. We thought Victorino, Dempster, and Gomes were brought in because they were nice guys, true pillars of a community. It turns out, they could play a little baseball too. David Ross was the first free agent signing coming into this season. Many were upset he was given $8 million over two years. It turns out he was worth every penny. The Red Sox went on to win 97 games during the regular season. They never lost more than three games in a row. The won the American League East. They were tied with the St. Louis Cardinals for the best record in all of baseball. They brought Red Sox Nation back to postseason baseball. The 2013 postseason was a wild ride culminating in winning the freaking World Series! In the postseason they beat guys named Price, Moore, Verlander, Scherzer, Sanchez, Wainwright, and Wacha. Those are some of the best names to toe the rubber in 2013. We should always remember Wil Myers botching a fly ball on the warning track in the very first game of the postseason against the Rays. How about David Price’s mental breakdown on Twitter after getting tuned up in Game 2 of the divisional series? After eliminating the Rays, the Sox moved on to Detroit. 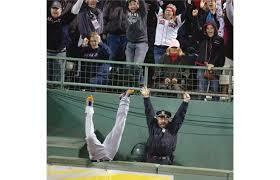 We always remeber David Ortiz’s grand slam in Game 2 of the ALCS that sent Torii Hunter sprawling into the bullpen. It was the hit that gave Steve Horgan a name in Boston sports history. 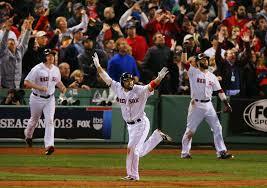 Shane Victorino’s Game 6 grand slam off of Jose Veras will forever be remembered in Red Sox lore. Shane Victorino, the same guy who Red Sox fans weren’t overly excited about in the offseason. The same guy who Red Sox fans wanted Josh Hamilton over, provided the biggest hit of the post season. The Tigers’ pitching was literally unhittable for the Sox at times throughout the series. But the Sox overcame it and beat the Tigers in 6. On to the World Series, the Sox marched. David Ortiz and Jon Lester put up legendary performances. Ortiz catapaulted himself to the forefront of New England sports history, as one of the top 3 greatest athlete’s to play in this city. The Red Sox faced no obstructions all season in achieving the goal they set in the Spring. (see what I did there?) Koji Uehara was his dominant self. Has there ever been a more dominant closer in one season in baseball history? John Lackey, the most hated man in Boston 2 years ago, became among the most loved. We saw a glimpse of the future in Xander Bogaerts. And the future looks great. Enjoy these celebrations now. Unfortunately it does not look like these 25 guys will be together again.